Filler up. Needle-free alternative to erase deep wrinkles. Easier than a doctor's office visit, this two-week at-home regimen fills, smooths, lifts and tightens skin like dermatologist's injectibles, but with no needles. Rebuilds, retexturizes and recontours skin naturally for results that last up to four months. 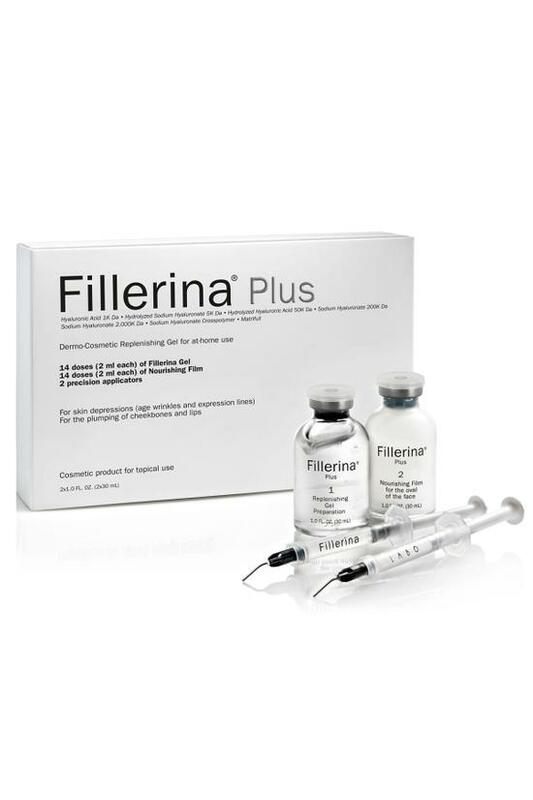 The Fillerina Replenishing Treatment with the replenishing gel and nourishing film must be used every day for 14 days, applying 2 ml of Replenishing Gel (the plumper) (Fillerina 1) to the wrinkles, on the most marked microrelief and the areas that require particular plumping up (cheekbones, lips). The application must be carried out using the special Precision Applicator (Applicator1) displayed at the top of this page, which makes it possible to draw up the product and to release it accurately into the desired areas. The Replenishing Gel plumper should be left to work for 10 minutes in order to allow the active principles to plump up the application areas. After 10 minutes, gently tap the remaining product with your fingers to complete the application. Next apply the Nourishing Film (Fillerina 2), which provides a sufficient amount of moisturising and nourishing substances, and allows the Replenishing Gel application to be completed with maximum comfort for the skin of the face and neck. Draw up between 1 and 2 ml of the Film, as required, and apply it all over the face and neck. The Nourishing Film is thicker than the Replenishing Gel, and requires patience during extraction. After the application of the Nourishing Film with (Applicator2), rinse both applicators in lukewarm water to avoid any buildup of product. Then finish by closing the bottles using the cap found inside the box. Do not lay the bottle back into the box as it may cause spillage. "Fillerina Plus Nourishing Film- Aqua, Cyclopentasiloxane,Glycerin, HDI/Trimethylol Hexyllactone Crosspolymer, Polysilicone-11, C30-45 Alkyl Cetearyl Dimethicone, Steareth-2, Xylitol, Butylene Glycol, Ammonium Acryloyldimethytaurate/VP Copolymer, Hydrogenated Lecithin, Steareth-21, Limnanthes Alba Seed Oil, Phenoxyethanol, Boron Nitride, Tocopheryl Acetate, Stearic Acid, Palmitic Acid, Sodium Chloride, Diazolidinyl Urea, Parfum, Lecithin, Pseudoalteromonas Ferment Extract, Allantoin, Xanthan Gum, Butyrospermum Parkii Butter, Silica, Alcohol, Disodium EDTA, BHT Limonene, Cyathea Cumingii Leaf Extract, Linalool, Hexyl Cinnamal, Sodium Hydroxide, Butylphenyl Methylpropional, Geraniol, Citronellol, Caprylyl Glycol, Arginine, Coumarin, Citral, Acetyl Hexapeptide-30. Fillerina Plus Cosmetic Gel- Aqua, Glycerin, Hydrolyzed Glycosaminoglycans, Sodium Hyaluronate,Caprylyl Glycol, 1,2-Hexanediol, Butylene Glycol, Sodium Hyaluronate Crosspolymer, Hydrolyzed Hyaluronic Acid Hyaluronic Acid, Hydroxypropyl Cyclodexterin, Hydrolyzed Sodium Hyaluronate, Tropolone, Disodium EDTA, Pentylene Glycol, Sodium Chloride, Ethylhexylglycerin, Palmitoyl Tripeptide-38, Acetyl Hexapeptide-37."